© Neil Turner, March 2014. Passenger on the train between Bournemouth & London Waterloo reading HEAT magazine. Every once in a while I take the train to London for meetings and the occasional job where I don’t have to carry half a ton of cameras, lights and computers. One of my favourite ways to pass the time is to do a bit of train photography and yesterday’s journey gave me a few nice frames where the light was good. Normally I just bung them from the camera (in this case my adorable Fujifilm X20) via an Eye-Fi card onto my iPhone or iPad and then straight to Twitter or EyeEm. I rarely give them a second glance when I get home but I wanted to post this picture because of the light. 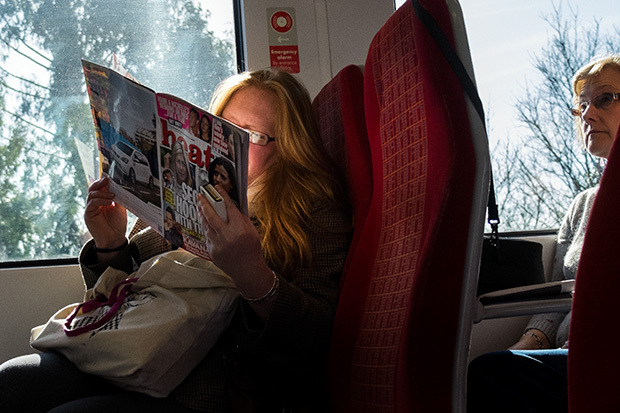 The sun was coming at just the right angle to reflect a lot of light back into the woman’s face from the pages of Heat Magazine at exactly the same time as the woman sitting behind her appeared to be getting interested in the page through the small gap between the seats. I have no idea if she was actually looking at the page or whether it was a happy coincidence – either way, the light made me do it! Love it Neil, that little camera is perfect for these kind of pictures. You’d never even have thought about taking a picture if you’d had a DSLR with you, probably.